TIP 1: When you slide over for the second shot, you -- and most importantly your camera -- should move in a parallel line. TIP 2: Normally, the camera should be moved about 6cm or 2.5 inches to match the average interocular distance between human eyes. 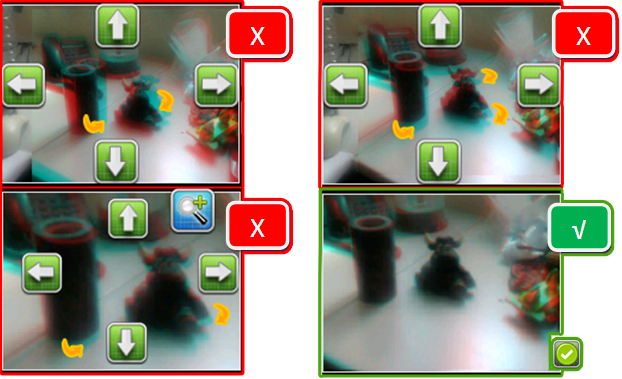 For closer objects, move the camera less between photos. For more distant objects, move it more. You are almost done. But first the left and right eye images need to be better aligned. This step is crucial because it allows the right view picture to be shifted over while the left-view picture is still visible. Pick a point in the center of the picture to match up; for example, if a person is your subject, eye pupils are a good target. Zoom in on the target by pressing the magnifying button icon in the tool bar. Using the up, down, left and right buttons, slide the left image over until your target matches up and no longer shows any rings of color. In other words, the overall goal in this step is to limit the colored tints as much as possible.